Black Cab Insurance is a specialised area of insurance, find exactly what you need through Moneymaxim and a carefully selected panel of insurers. We specialise in black cab insurance which is a common expression for traditional public hire taxis (cabs which can be hailed in the street). The service offered will give you the opportunity to get competitive quotations from a range of companies, such as Aviva, RSA and the Equity Insurance Group. All understand the demands of the black cab driving community and recognise that, when it comes to a claim, drivers cannot afford for their vehicles to be off the road for one minute longer than necessary. So, rather than seeking multiple quotations from a series of different websites, just ask us and we will get the panel of specialists we partner with on the case, sorting you out a range of competitive quotations in next to no time. We will be delighted to help you find cover for public hire taxis, otherwise known as black cabs. 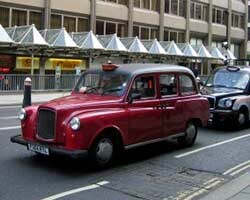 Public hire taxis can be hailed on the street or picked up at a station at any time. Commonly called black cabs or more properly hackney cabs or carriages, these cabs are normally more heavily regulated than minicabs. If you are working within the London Public Carriage Office area you will have had to have passed 'The Knowledge' proving your ability to work out the quickest route across the capital in an instant. Most black cab drivers, sensibly, choose comprehensive cover for their vehicles as they are essential to you as your main source of income. The legal minimum third party cover would not normally offer a replacement vehicle if yours was off the road due to an 'at fault' incident. If the taxi is being insured for just you to drive it, ignore this paragraph but if you are looking to add additional drivers do consider the following. Adding drivers under the age of 25 can increase your premium, as it probably will if your other drivers have a poorer driving record or a history of claims. If your extra drivers do fall into this category it might be worth seeing if you can avoid them being added. If however your additional divers have a better record than your own you might find their addition will benefit you. Do, however, be totally open when applying for insurance - as, if you pretend a driver with a better record or who is older than the main driver when that is not actually the case (a process called 'fronting'), the insurer may decide that your claim is invalid leaving you very out of pocket. The length of time you have held a taxi badge for can significantly reduce your premiums as, after a year, insurers will start to offer discounts. Again though insurers will be flexible, but this will more than likely, be reflected in the premium. Mirrored no claims bonuses are a wonderful thing - this means that if you have a no claims bonus (NCB) on your normal car policy this can be mirrored onto your private hire or public hire insurance policy. This only really applies when you first take out taxi insurance as thereafter your taxi insurance no claims discount will be the more important factor. Long term it's much better to buy an annual rather than monthly policy as it's only annual policies which usually allow you to build a no claims bonus. If you can buy an annual policy, but pay monthly for it, then you can spread the costs. Where your vehicle is kept overnight can have an impact on your taxi premium, as can the amount of excess you are willing to pay if you have an at fault accident or your taxi is stolen. Add ons such as taxi breakdown cover(including cover which would mean you are supplied with a replacement taxi if your own vehicle is off the road) are worthwhile considering. Public Liability insurance is also worth considering in case a passenger makes a claim against you. This can extend beyond the third party cover your taxi insurance offers. The most obvious form of insurance to consider is fully comprehensive cover to ensure you protect your vehicle fully as it is essential if you are to work! Public liability insurance is something we would recommend as that extra cost in buying it may protect you should a third party get injured in your cab. In addition to these, third party, fire and theft, breakdown assistance and vehicle replacement may all come in very handy in getting you back on the road in no time ensuring minimum loss in income.